In this week's news, the residents of Balcombe are looking to raise funds to install solar panels to power the village. The initial plan is to raise £300,000 for enough panels to power 7.5% of the village, with the intention of continuing as far as possible towards 100%. On the one hand, I think community involvement in energy generation is a good thing. On the other hand, these projects are made financially viable via subsidies added to everyone's energy bills. Indeed, project documentation makes clear that their efforts are only made financially viable via the feed-in tariff. The regressive way that renewable projects are currently funded is something that irks me. We spent time in Balcombe last year deploying seismometers during Cuadrilla's drilling, and it's a typical well-heeled home county village. Current solar subsidies have the effect of taking money from the average bill-payer, such as myself, who is a long way from owning any property at all, let alone a property suitable for solar panels, and handing it on a plate to wealthy landowners: people who already own buildings with large roofs on which to install panels. That issue aside, this provides an excellent opportunity to compare the footprint of different energy sources. While the group itself don't make the connection, the way the story has been reported gives the impression that the solar developments represent in some way an alternative to the drilling conducted last summer, with a significant portion of the village opposing Cuadrilla's plans to conduct flow-tests on the well. With that in mind, how do the two plans stack up in terms of the energy they might provide? To answer this question, things will have to get a little hypothetical. We all know that in fact drilling at Balcombe is for oil, rather than gas. As such, a direct comparison with solar is slightly tricky, because solar farms will be used for electricity, while oil is mainly used for transportation - we're a long way from solar-powered aeroplanes! Also, the operations at Balcombe are not actually targetting shale rocks, and hydraulic fracturing will not be required. So, for the sake of a meaningful comparison, lets pretend that the pad at Balcombe were to be developed into a full-scale shale gas production pad, with 10 lateral wells, such as we might expect on the Bowland shale in Lancashire. I shall now revisit a calculation I performed at the end of a previous post. In that calculation I assumed a total recovered gas volume (Estimated Ultimate Recovery, EUR) of 3bcf (billion cubic feet) per well. This may already be well out of date, as Cabot are now reporting EURs over 20bcf! Regardless, I shall continue to use the conservative numbers here. So our single well pad will produce 30bcf, over a period of 30 years or so. 30bcf is 30 million MMBTU, which at $8 per MMBTU in the European market is $240 million (or about £150 million). So following UKOOG's community charter of 1% of revenue, it would pay over £1 million to the local community. In terms of electricity generation, 30 MMBTU will generate approximately 5,000GWh of electricity. Therefore our hypothetical Balcombe shale gas pad will, over the 30 year production period, produce an average of 166GWh per year of electricity. How does this compare with proposed solar development? How many solar panels would be needed to match this rate? I'm not a solar expert, so if someone has better numbers then please comment. I've based this calculation on the numbers provided by the Westmill Solar Park in Wiltshire. The Westmill site occupies 30 acres, and produces 4.8GWh per year. This means, assuming that output scales linearly with area, we would need 35 Westmill Parks to match the output from our single hypothetical shale pad. Our hypothetical solar park would occupy an area of over 1,000 acres, or 4 square kilometres. As regular readers will know from my new "Image of the Day" series, a picture tells a thousand words. The map below puts these areas into context. 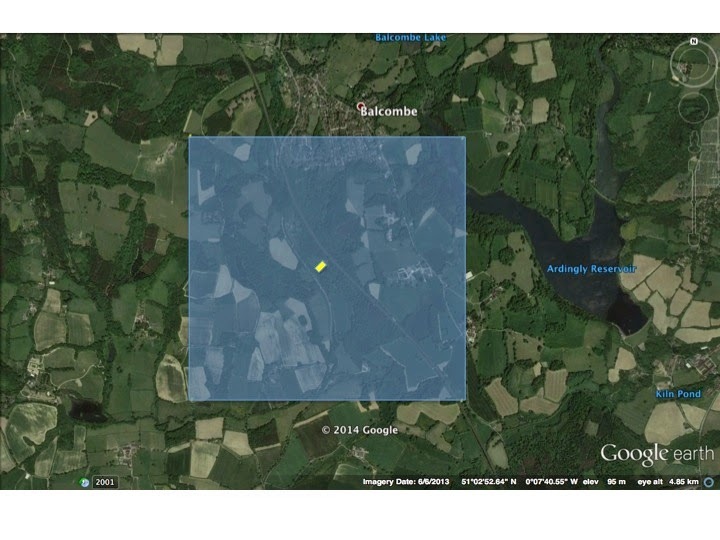 The satellite shot is centred on the well pad at Balcombe. The small yellow rectangle shows the extent of the well pad. The large blue square shows the extent of land that would have to be completely covered by solar panels in order to generate the same amount of electricity. The whole of Balcombe village (excluding outlying farms etc) fits easily into one quarter of our hypothetical solar plant. This comparison highlights the issues facing us today as we try to tackle the energy triumvirate: cheap energy, supplied securely, with low CO2 emissions. This video demonstrates the same issue, but comparing nuclear energy to wind. Our modern economy has been built on energy sources that provide a lot of power for comparatively little footprint, and changing this will be incredibly difficult. While I have my doubts about the way they are funded, community energy schemes are to be encouraged and applauded. Equally, it is important that we continue to develop renewable energy sources, as this will allow engineers to develop the technologies, improving them to the point that they become capable of providing a genuine and feasible alternative. Excellent post! It is this sort of reality which is missing from most of the debate about energy, etc.. There is one key element needed to make the comparison complete: how to address the intermittancy of solar? Some form of energy storage will be needed to harvest the solar output and make it available overnight and on dull, rainy days. As the viable technology for large-scale storage (Pumped hydro) is not available in areas like Balcombe, maybe each house will have its own chunky battery-pack? I also like comparisons with renewables output. In 2013, we had 16.5 TWh of onshore wind, 10.9TWh of offshore wind and an alleged 2 TWh of PV solar. Dividing by 8,760 hours in a year, that's 1.88GW of onshore wind, 1.24GW of offshore, and 0.23GW of solar on average through the year. Drax power station produced 27.1 TWh in 2012 (and 26.2TWh in 2013 as it increased its woodchip burn) - basically as much as ALL the windfarms, both onshore and offshore. Put in terms of oil equivalent (using GCV of 42MJ/kg, 7.5bbl/tonne) we get 29,000 b/d for onshore wind, 19,000 b/d for offshore wind, and 3,500 b/d for solar - 51,500b/d altogether, or just over 2.5 mtoe p.a. Wytch Farm alone has produced over 60 mtoe so far - probably more than the lifetime output from all these windfarms and solar panels. When have green loonies ever taken notice of cogent logic? Communism by it's very nature is anti logic and it usually ends up feathering the beds of the elites. Indeed, the EU/western style communism, is doing very nicely thank you - the political elite in bed with the corporate paymasters - I mean what's not to like and if I were a betting type - I'd surmise most of the Balcombe residentzia - most of the majority are retirees from the bureaucratic Nomenklatura and corporate............insurance, banking sector et al. Stiffing the rest of us is par for the course old chap - see you in the Nineteenth! Oh btw, good blog and a great blog post - cogently argued. An easy-to-understand comparison. Thank you. Considering solar in the UK is an 'expensive' power source, could you do a similar comparison vs wind turbines? As a 3-dimensional block compared with the 3-dimensional extent of a gas-fracking site. And commented that it would also equate to about 30 commercial wind turbines. So, after they land, they never charge the massive battery the airplane has? Attempting to dupe the public is par for the course for the renewables industry. The UK currently has a spinning energy reserve of just 2% so solar power is the way forward to provide alternative energy supplies. The issue of viable generating capacity for peak loads is a key issue, and one that solar will do next to nothing to solve. Peak demand is most likely to occur on a cold winter evening, at which point solar will be of no use at all. This is exactly why back-up capacity in the form of gas generation is so vital. Nice Post! Most of jurisdictions and availability over the Canada offer seductive financial encouragement they are driving down the upfront metropolis costs of a solar energy system. The aim is to produce enough electricity for the village. It's population (Wikipedia) is 1,765. Average domestic consumption per capita in the UK 1,985 kWh/year (shrinkthatfootprint.com). This means the village needs 3,5 GWh a year - which panels equivalent to Westmill would provide.